Here are 6 interesting sea lion facts for your kids to learn all about these cunning and adorable marine mammals! Sea lions are among the most fascinating creatures in all of the world’s oceans. These social marine mammals are found in climates ranging from subarctic to tropical and are often seen swimming in the waters off the coast of Puerto Vallarta. They are known for their playful behavior, agility in the water, cunning intelligence, and their distinct adorable appearance! Below, we spend some time talking about sea lions and all of their amazing characteristics. 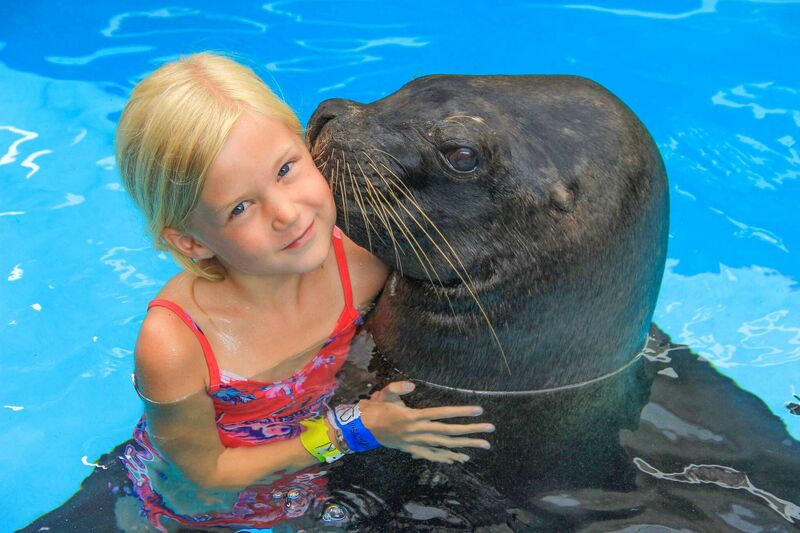 Read on for 4 Interesting Sea Lion Facts for Kids and see sea lions firsthand in Puerto Vallarta with our tours here at Vallarta Adventures! Sea lions are marine mammals of the Otariidae family. Sea lions are large marine mammals native to all of the world’s oceans (other than the north Atlantic). Together with the fur seals, they comprise the family Otariidae: the eared seals. Sea lions are characterized by external ear flaps, long foreflippers, the ability to walk on all fours, short, thick hair, and a big chest and belly. Among these characteristics, the one that most readily distinguishes sea lions from regular seals is their ability to walk on all fours. Sea lions are social animals and can often be seen in large groups both on land and at sea. Their coloration ranges from grey-white to nearly black, though most are light to dark brown in color. There are six extant sea lion species and one extinct sea lion species (the Japanese sea lion). How big are sea lions? How much does a sea lion weigh? Depending on the species, sea lions can range in size from 200-400 pounds in weight and 6 feet in length to 2,500 pounds in weight and 11 feet in length. Sea lion size varies considerably depending on both species and gender. Sexual dimorphism is a defining trait of sea lions — males are larger than females across all species. The largest sea lion species is the Stellar’s sea lion. Males can reach 2,500 pounds in weight and 11 feet in length. Females can reach nearly 800 pounds in weight and 9 feet in length. The California sea lion, average in terms of sea lion size, has males weighing in around 600-800 pounds and measuring 6-8 feet in length, while females weigh 200-300 pounds and measure 5-6 feet in length. Sea lions swim using their long, powerful foreflippers and hind flippers. Sea lions are strong swimmers can reach speeds of nearly 20 miles per hour in the water. They swim using their long foreflippers to generate power and their hind flippers to steer. Sea lions hunt underwater and can dive to depths of 300 meters. Can sea lions breathe under water? How long can sea lions hold their breath? No, sea lions cannot breathe underwater. However, they can hold their breath for approximately 8 to 20 minutes! Although they can dive to extraordinary depths, sea lions cannot breathe underwater. As they are mammals, sea lions must breathe air in order to survive. However, sea lions have special physiological builds that allow them to conserve oxygen while diving. They can hold their breath for as long as 20 minutes (approximately)! How do seal lions breathe? On land, sea lions breathe through their nostrils. Their nostrils instinctively shut when they dive underwater. Sea lions' nostrils are naturally closed when they are relaxing. They have special muscles that open the nostrils when they need to breathe. When sea lions are swimming underwater, their nostrils remain closed. How long do sea lions live? How long do sea lions live in human care? The average lifespan for sea lions in the wild is 20 years. The average lifespan for sea lions in human care is 30 years. In the wild, most sea lions will reach the age of 20. However, the wear and tear of hunting, inclement weather, and many other environmental factors puts a cap on most sea lions’ lifespans much past the two-decade mark. In human care, where sea lions have ready access to food, medical care, and protected living environments, their lifespan can extend up to 30 years. Interested in learning more about sea lions? Want to see these amazing marine mammals firsthand? Here at Vallarta Adventures, we proudly offer a number of excellent tours designed to give Vallarta travelers a chance to see and interact with sea lions like never before. Spot sea lions in their natural habitats on one of our many Vallarta sea adventures, or meet and greet sea lions (and dolphins!) up close and personal on our Sea Lion Encounter and Dolphin Adventure tours hosted at our award-winning marine center. Follow the links above to learn more about these excellent Puerto Vallarta tours, and book yours with our team here at Vallarta Adventures today!